I am very proud of the fact that I only recommend makeup that I truly believe in – after ten years in the makeup industry I have used a lot of different brands and I have cherry picked the very best to use on my clients. 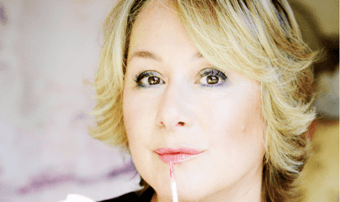 I came across the Ariane Poole makeup brand a couple of years ago while working with talented Makeup Artist Jo Leversuch who is based in Darlington. We were both in Notting Hill at the Jemma Kidd Studio and she was raving about Ariane’s makeup. I am very excited to say that two years later in 2015 I am now working with and selling Ariane’s makeup to my clients. Even more excitingly, Ariane’s products are now available directly via my website: www.melenglandmakeup.com. Go to my website and simply click on BUY MAKEUP select your products and they will be delivered direct to your home. I will be letting you know lots more about my favourite Ariane Poole makeup in my upcoming blog posts. Including lots more about her multi-award winning Concealer Palette. “As an international make-up artist in the fashion and beauty industry for over 25 years, my philosophy on make-up is that you should notice the woman not the make-up; everyone should compliment YOU on how great YOU look! I’ve had the opportunity of working with celebrities, top models, photographers and even royalty. But I get the greatest satisfaction from doing makeovers on real women and showing them how they too can look their best with the right products and some useful tricks of the trade. My passion for all things makeup and beauty started at a very early age and it didn’t take me long to know that this was the path for me. After completing a degree in Cosmetology in Canada I worked for a brief time in Vancouver before being headhunted by Biba UK in the late 70’s to be their official makeup artist. Upon arriving in London in Spring ‘79 I soon discovered that I was one of only a handful of professional makeup artists in the country and I am honoured to have been one of the pioneers of this fabulous industry. I have had the privilege to work with so many of the world’s best fashion & beauty icons including celebrities such as Catherine Zeta Jones, Penelope Cruz, Yasmin Le Bon, Anna Friel, Queen Noor of Jordan, Andie McDowell, Iman, Talisa Soto, Femke Jansen, Rachel Weiss, Inez Van Lamsveerde, Veronica Webb, Christy Turlington, Uma Thurman, Jacqueline Bisset, Cilla Black, Helena Bonham Carter, Shikira Cane, Jackie Collins, Julie Walters, Princess Von Furstenburg, Pia Getty, The Queen & Princess of Greece, Fern Britton, Elizabeth Hurley, Bianca Jagger, Felicity Kendal, Joanna Lumley, Tandy Newton, Julia Ormand, Joan Rivers, Lady de Rothschild, Jane Seymour, Twiggy, Donatella Versace, Duchess of York , Alberta Ferretti, Lulu, Tess Daley, Denise Van Outen, Lisa Snowdon, Sadie Frost, Saffron Burrows, Tara Banks, Diana Moran, Jodie Kidd, Susanna Constantine (Triny & Susanna), Lorraine Kelly, Katy Hill, Kim Wilde and the gorgeous Bryan Ferry, Phil Collins, Duran Duran and Richard E Grant. I have also worked with some of the most beautiful women in the world on Magazines including Cosmopolitan, Elle (Spain), Elle (UK), Elle (Hong Kong), Esquire, The New Yorker, Harpers & Queens (UK), Hello, Cosmo Brides, W, Loaded, Mail on Sunday, Marie Claire, Marie Claire Health Beauty, OK Magazine, Red, Sunday Times, Tatler, Telegraph, Vanity Fair, Vogue (German), Vogue (Mexican), Vogue (UK), You Magazine, Eve, Brides, Essentials, Good Housekeeping, Real, Shine, Woman’s Journal, You Your Wedding, Express, M Mag, Top Sante, Woman’s Own, Woman & Home, She, The Daily Mail, The Express, The Times, Woman, GQ. and fashion shows for John Galliano, Browns, Caroline Charles, Debenhams, Emanuel, Betty Jackson, Jaeger, Donna Karen, Edina Ronay, Miss Selfridge, Selfridges, St. Martins, Wallis, 30 Years of Butler & Wilson, 40 Years of Butler & Wilson, Breast Cancer Care Fashion Shows from 1998 to present day and Graduate Fashion Week 2009 to 2012, London Fashion Week 1979 to 2001. My many appearances on TV include This Morning (ITV), Style Challenge (BBC1), Sky Special K, GMTV (ITV), LK Today (ITV), Makeover Hit Squad (Weekly Slot), Fashion Livetime (Weekly Slot), Wellbeing (Daily Beauty Slot), Big Breakfast (Weekly Beauty Slot Channel 4), Let’s Get Beautiful (20 part weekly slot), After Five (ITV), Carlton A to Z of Food Beauty, City Woman, David Emmanuel Show, The Wedding Show, Wild About Weddings, Good Housekeeping Show, Liz Earle Show , Miriam Stoppard Show, Style Council, Bride & Grooming Mum Makeover. There will be lots more from me Mel England in the next few weeks about how to use Ariane Poole makeup to look and feel amazing every day! Click here to look at the product range now. Don’t forget I offer Makeup Lessons – private or groups. Learn how to apply makeup like a professional. For more information visit my website.